Workplace accidents frequently happen in Georgia. In fact, according to the U.S. Bureau of Labor Statistics, private industry employers in the state reported approximately 78,200 nonfatal workplace injuries in 2017. Of those 78,200 work-related injuries, roughly 40,700 were severe enough to result in multiple days away from the job, job transfers, or task restrictions. In addition to devastating physical injuries, workplace accidents can also cause significant financial problems for injured employees, often due to costly, unexpected medical expenses, and wages lost while at home recovering. Financial worries make an already stressful time even more difficult. Fortunately, workers injured in The Peach State while carrying out duties in the scope of their employment may be entitled to collect benefits through the workers' compensation system. Are you out of work after being injured on the job? Here's what you need to know about temporary total disability workers' compensation benefits. Temporary partial disability (TPD). 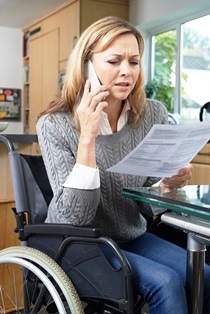 Individuals who suffered a workplace injury that prevents them from performing their job at full capacity may be entitled to light or modified work duties, and potential TPD payments. Permanent partial disability (PPD). Employs who sustain on-the-job injuries that leave them temporarily or permanently partially disabled may be eligible for PPD workers' comp benefits. Temporary total disability (TTD). When someone's injuries prevent them from returning to work entirely—effectively impairing their earning capacity—they may be able to collect TTD benefits. Such benefits allow injured workers to collect up to two-thirds of their average weekly wage: up to $575 per week for many as 400 weeks after the accident. Be out of work for at least seven days. Be examined by a member of an approved panel of physicians to determine the extent of the on-the-job injury. Receive significant work restrictions from the treating physician, such as no bending or lifting. Be deemed totally disabled and completely unable to work by the treating physician from the approved panel. A knowledgeable Georgia workers' compensation attorney can help injured workers determine if they might be eligible for this type of benefits. Navigating the workers' compensation litigation process is frequently complex and frustrating. Without experienced legal counsel, it's far too easy for injured workers to make mistakes that could damage their ability to collect fair financial awards. People especially need a workers' compensation attorney's know-how when learning how to deal with insurance company adjusters. These seasoned insurance professionals are tasked with paying claimants as little as possible to protect a company's bottom line. To that end, they may dig up unflattering information, misconstrue an injured worker's words or actions, or drag out the litigation process to coerce someone so desperate for money they'll accept a settlement much less than they deserve. Workers' compensation attorneys can help clients overcome these and other common case challenges. If you were hurt on the job in Georgia, it's important to understand your legal rights and options, including what types of workers' compensation benefits may be available to you. At Rechtman & Spevak, our skilled personal injury and workers' compensation attorneys have helped injured workers throughout the state secure the compensation and justice they deserve. Do you have questions about a workers' compensation case? Contact us today to schedule an appointment for a free initial consultation to discuss the details with a member of our legal team.